The nun now known as Ven. Thubten Pende was born in Hue, the Imperial city of Vietnam in 1963. 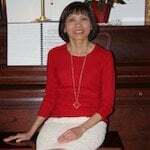 Her childhood dream of going to the U.S. to study was shattered when the Communists took over South Vietnam in 1975. Because her father worked for the U.S. government, she was not allowed to go to college after graduation from high school. After a few unsuccessful attempts to escape Vietnam by boat, she had no choice but to learn how to sew clothes for a living. Finally, in October 1990, Ven. Pende and her family were able to reunite in the U.S. with her younger brother. He had fled Vietnam by boat in 1980 when he was seventeen years old. Following her younger brother’s advice, she decided to go back to college in Mission Viejo, California after a 10-year absence from school. She graduated in 1999 with double majors in Mathematics and Statistics from California Polytechnic State University, San Luis Obispo. After graduation, she worked for the airlines as a programmer analyst for almost 15 years. Even though she had a good job and enjoyed the opportunity to travel a lot, she was unhappy and felt unfulfilled. One day her older sister gave her some cassette tapes of the Buddha’s teachings from a Vietnamese Zen master. The more she listened to the teachings, the more interested she became to learn how to tame her monkey mind and let go of her afflictions. 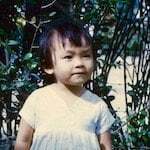 However, she knew that living in the world with endless distractions would make it very difficult to seriously devote her time and energy to apply the Buddha’s teachings to her daily life, much less to ultimately know her true, deep self. When her mom passed away, she felt it was the right time to pursue a call to the monastic life. 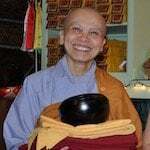 She was ordained in September, 2014 in the Vietnamese Zen tradition and trained at temples in California and Vietnam. After reading Taming the Mind by Ven. Thubten Chodron, Ven. Pende checked out the Abbey’s website. She was very impressed by the Abbey’s well-balanced daily schedule, the well-structured monastic community guidelines, and the well-oriented operating principles. Ven. Pende came to the Abbey for a short visit in June, 2016, and returned in September for a three-month stay. She was interested in further exploring how a traditional monastic setting can be adapted to the present American culture, as well as how Dharma practice and teaching are explained in a Western context at the Abbey. After her first month at the Abbey, Ven. Pende extended her stay to include the three-month winter retreat. Just before the winter retreat began, she asked to join the community. 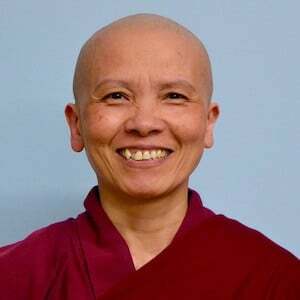 She is deeply honored that Venerable Abbess accepted her request and gave her a new lineage name, Thubten Pende, on Chinese Lunar New Year, January 28, 2017. She received full ordination in Taiwan in 2017.